Healthcare professionals suggest that interactive patient portals will improve patient experiences and overall quality of care. School is back in session, flu season is in full play, and it’s business as usual in the average physician waiting room. Add fears about the H1N1 virus to this year’s scenario, and the commotion in many physician offices becomes almost unmanageable. It’s a familiar scene: Parents bring their children in with a multitude of viruses spreading throughout the schools; adults seek early intervention to flu strains to minimize absences from work; and most doctors will quickly acknowledge that many who enter the front door just simply don’t need to be seen in person. Consider other scenarios where patients just need to come in for a follow-up visit to discuss test results or findings from routine procedures with their physician. If another alternative were available, healthcare professionals agree that many otherwise “healthy” patients would prefer to avoid making another appointment and fighting traffic only to enter a waiting room full of communicable illnesses. The answer? Many believe that interactive patient portals may provide a cure to the waiting room game in many physician practices, as well as offer access to medical specialties for patients living in remote areas. It’s a better alternative to the clinical setting, as it’s the familiar surroundings of a patient’s home. Originally designed as a way to optimize workflow efficiencies, reduce costs, and maximize reimbursement opportunities, portals are evolving into a mechanism to deliver care. Patients and physicians are finding that the benefits go well beyond previous offerings of static applications such as making appointments and paying bills. 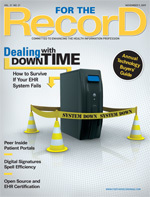 Louis Cornacchia, MD, CEO of New York-based Doctations Inc, believes portals will continue to evolve as a way to empower patients through a network of healthcare delivery that generates medical documentation in all venues: the physician’s private office, the physician group’s office, the ambulatory surgery center, and hospitals of varying sizes. My Health Manager, the PHR provided by Kaiser Permanente to its adult members, allows participants to securely access their records from home, as well as e-mail their physicians; order prescriptions; make, change, or cancel appointments; and even view lab results. All of these interactions are done on the Web at no extra charge. Parikh points out that patients currently generate more than 600,000 secure e-mail messages each month to doctors and clinicians, and more than 1.6 million lab test results are viewed online, making them two of the more popular features on My Health Manager. Rosenthal notes that Montefiore Medical Center’s Internet-powered patient portal also does not see any differentiation along socioeconomic lines. The offering—MyMontefiore—is a product of RelayHealth that was introduced as a pilot program in 2006 and later rolled out to all 21 Montefiore Medical Group office sites in the Bronx and Westchester. While patients have their own “landing system” on MyMontefiore, the program currently does not integrate directly to a patient’s EMR. Rosenthal notes that the organization is in the process of making a “network medical record” for portability purposes to other physicians. “Currently, they get a PHR, but that doesn’t populate to the health record in a physician’s office,” he explains. Other strengths of this type of interaction come in the way of more detailed communication than what may be garnered in a phone conversation taken at the front desk. An initial fear communicated by physicians connected to the MyMontefiore systems centered around concerns that e-mail would actually slow down productivity. That has not been the case, according to Rosenthal. Building on the success of My Health Manager, Kaiser currently has pilot programs in the works to develop patient questionnaires focused on specific issues—namely infant constipation, thyroid disease, and headaches—whereby physicians can communicate with patients via an electronic portal. Alongside those initiatives, the organization recently introduced four new online lifestyle programs for diabetes, depression, insomnia, and back pain. These complement the site’s other online health programs, including weight management, pain management, and smoking cessation. Rosenthal notes that MyMontefiore is also looking at ways to promote more preventive healthcare measures and begin a regular dialogue with segmented patient populations. With 40,000 patients in the system, the organization can do things such as send out reminders for mammography screenings or colonoscopies. There is also the opportunity to communicate with populations of people who carry the same chronic illness. For most primary care physicians, the challenge boils down to reimbursement. While the use of electronic communication with patients has the potential to create efficiencies in a practice, the use of e-mail and other electronic interchange via patient portals has not made it into the mainstream of the average private practice. Why? Because most insurance carriers do not cover this type of healthcare delivery. As a capitated system, Kaiser Permanente members prepay for their care, and doctors use these resources to focus on prevention and quality, Parikh points out. Issues over reimbursement do not play into the equation, allowing care to be delivered in more cutting-edge ways. MyMontefiore is not considered an office visit by most insurers, so it is not a reimbursable consultation. Rosenthal notes that the system was implemented with more of a customer service consideration in mind. “We decided that there are three insurance companies in our marketplace that do reimburse for Web consults. … For the rest, we wouldn’t charge for it,” he says. Many healthcare professionals believe insurance companies are beginning to warm up to the idea of Web consults because, in the end, it makes sense, Cornacchia suggests. Cornacchia says the patient portal concept is evolving past the idea of patients interacting in a narrow community with just their primary care physician. Doctations could be such a network, comprising 250,000 healthcare providers and 62,000 patients. The offering gives physicians and patients access to medical records, billing, and electronic collaboration with their medical team in a real-time, HIPAA-compliant environment. According to Cornacchia, the bulk of Doctations’ participants are in New York, but the concept is building out across the country. Pointing to inherent challenges that exist when a patient wants to share data with more than one provider due to conflicts that exist between client-server architectures, he notes that Doctations addresses those interoperability issues. The solution’s concept supports multiple users accessing the same database from multiple sites. Essentially, patients control their information and manage who is permitted access. Currently, the patient pays for services directly to Doctations, which in turn reimburses the physician. Putting the Web to work as a tool for better healthcare will be successful only if patients find it to be to their liking. Rosenthal notes that the patient satisfaction rate with MyMontefiore has been high. For example, Joyce Denis, a 31-year-old Bronx native, was being treated at Montefiore’s Institute for Reproductive Medicine and Health. After two miscarriages, she is now well into her third pregnancy. She has been using MyMontefiore’s Web site for two years to communicate with her physician, Nanette Santoro, MD, a reproductive medicine specialist at Montefiore Medical Center.